"Jeanni challenges a very basic human function - the way we view the world around us, the way we look at things! She unpicks learned behaviour through art and demonstrates in a way I've never experienced before that we are all capable of so much more than we realise. This woman does what it says on the tin and more!" 3 x 3-hour lessons- Sketch, Perspective, Paint! 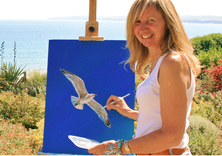 Bespoke art classes and courses for individuals and groups of all ages and abilities. My courses are designed to inspire and inform whilst giving a comprehensive core tool kit of knowledge as used by the Old Masters. My fun courses link to all mediums and give students the knowledge and confidence to manipulate and play with their new artistic skills, whilst breaking down the negative habits, assumptions and fears which may have previously prevented them discovering their full potential in art..
Used by individuals, couples, families and groups of all sizes including educational facilities and charities. I bring all the required equipment and work with you at a location of your choice such as the beaches of Cornwall, at my studio or other locations across the country and the world. Bespoke art-based courses designed to break down negative habits, assumptions and fears in order to build stronger teams and enhance performance outcomes. The British Basketball Team, UK Sport, Youth Sport Trust, The Olympic Coaches, BNP Paribas and Discovery Communications as well as Neuroscientists at Oxford University. I love art and usually depict images of the beautiful views in Cornwall. I am often commissioned to paint and draw bespoke images of portraits of people, animals, views and architectural images of buildings as can be seen above. ​I send a step by step visual diary of the progress of your commission so you can see it grow and form. My artwork can be seen online here and in galleries across Cornwall. Examples of my paintings and prints can be seen across the world.